Just two days after losing $220k to Viktor "Isildur1" Blom at $1k/$2k 2-7 Triple Draw tables German pro donthnrmepls took revenge yesterday morning by winning $247,982 from his Swedish rival in two short sessions. Both sessions were played at table Begonia II. The first lasted for 44 minutes and resulted in a $109,296 win for donthnrmepls from just 73 hands. After just under an hour's break the pair were back again for another 47 minutes of action and once again it was all one way traffic, with donthnrmepls adding another $138,686 to his bankroll. At this point Isildur1 quit the table. Referring back to their previous encounter when Isildur1 requested his opponent come back to play his button, donthnrmepls requested the same of Isildur1. Unfortunately for both players Isildur1 replied, "Only got 900 bucks in my account" - and was therefore unable to afford to play the button! Second on the daily leaderboard was UK pro JayP-AA who ended the day up $99,255 after finding success against RaulGonzales at the PLO and 8-Game tables. 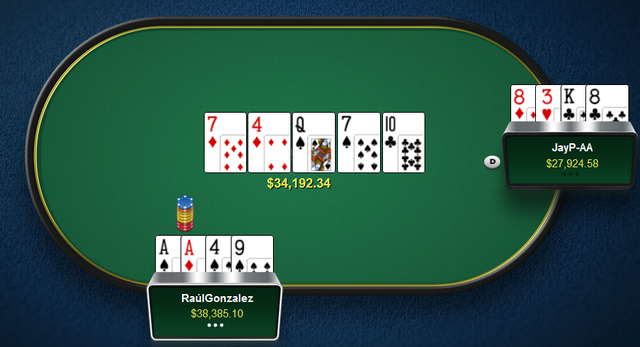 JayP-AA won just over $11k from RaulG during a 1hr 40min lunchtime session at the $50/$100 PLO tables. It would have been a bigger win for JayP-AA had he not been on the wrong end of the day's biggest pot. JayP-AA went on to win considerably more from RaulGonzales during a 3.5 hour evening session against him at the $400/$800 mixed game tables. It was a swingy match for over three hours with JayP-AA going up over $50k on a number of occasions before being pegged back to even. During the final minutes of the match, however, JayP-AA hit back to back big pots and managed to end the session with a $105,894 profit. After factoring in a $20k PLO loss to Cobus83 earlier in the evening JayP-AA's day ended with a $99,255 profit. Third place went to BongBob who spent a long day playing at the $25/$50 and $50/$100 PLO tables working up a $59,005 profit from over 1.2k hands played at the 6max tables, and in fourth was Gavin "gavz101" Cochrane who was back to winning ways after a couple of losses over the past few days. He won $31,659 from over 1.8k hands, again played at the $25/$50 and $50/$100 PLO tables.